In the current issue of Inside Crochet I have written an article about ‘swatching’ and ‘blocking’ your crochet. Why? Well like many converts I realise that when you discover something good and it changes the way you do things for the better – you just want to shout about it. 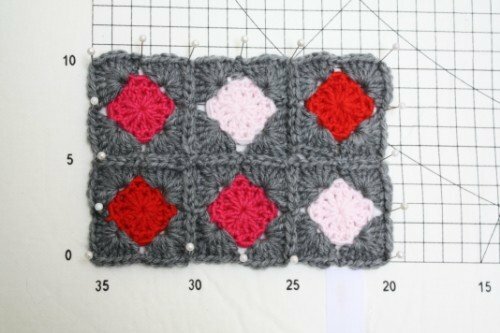 Swatching, or making a tension square, is a trial section of a pattern you are about to use with the hook and the yarn you have chosen. 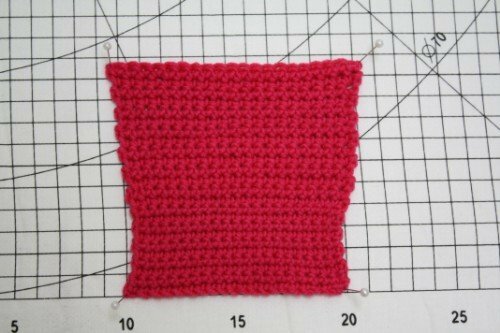 Blocking is shaping your finished crochet project to the measurements used in the pattern instructions. I think that when you start or rediscover knitting and crochet the excitement of embarking on a new project just makes us jump right in. You know, you have seen a pattern you have been dying to try, picked out some gorgeous yarn and just want to curl up and get clickety clacking. Making a tension square feels a little bit like coming in from school on a baking hot afternoon and being forced to do your maths homework instead of playing in the garden. But spending money on yarn means that by making sure your tension matches that specified on the pattern is a sensible investment. It is so frustrating to spend a couple of weeks making that dream project just for it not to fit. Everyone’s tension is different and by altering the needle or hook up or down a size you can guarantee you will match the measurements of the original design. If you can’t be persuaded to swatch then finishing your project by blocking it is almost a MUST. If you look at many of the gorgeous books or knitting magazines and marvel at the regular stitches of their featured items, it is tempting to look at our own work, and think ‘Mine doesn’t look like that’. Well you can bet your bottom dollar that all of the designers have blocked their work. Recently I read somewhere that blocking your work changes it from looking ‘homemade’ to ‘hand-crafted’. Generally when I am making a garment I like to block the individual sections of the garment. This makes sewing up so much easier. 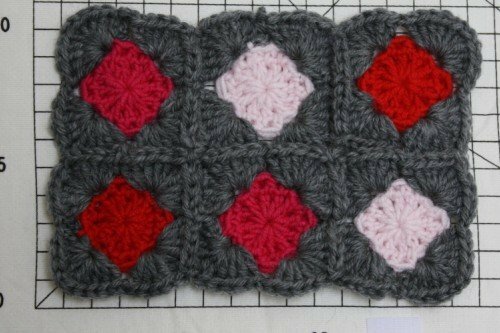 I then might block the finished item again when I have completed it. Overall, if I dampen the garment and then pin it out and let it dry, I see an enormous difference in the appearance of the stitches. All think kinks and creases formed from being in the project bag relax to give and even stitch appearance. Over the years I have moved from hogging the ironing board for a couple of days to the more practical solution of kids foam play mats. This is a genius idea, because for a large project you can link several mats together. Don’t forget to buy rust resistant pins and I would always advise leaving your project to dry for a couple of days if you can. If you are serious about your craft then I would recommend a blocking mat with grid markings. 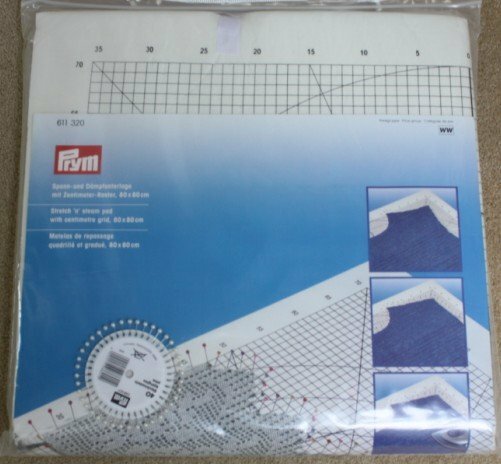 The Knitting Shed are selling this excellent fold-able blocking mat which is both really helpful for blocking crochet squares and practical because it can be easily tucked away in between projects. The article in the magazine has quite bit more detail and specifics about different techniques. All I can say really is that although I am a cheeky eager crafter I wouldn’t go back to my old impatient ways.